Fast delivery. Easy to fill. Perfect fit. very quick delivery. had it on the bike in no time. works a dream. Will use Tayna again. very good service. 6 out 5 Stars. Arrived on time. Instructions are good. Helpful on the phone.. Arrived quickly... Does the job ! The best part is that it arrives dry. This means that you fill it yourself when you are ready and can supervise the commissioning. Why is this helpful ? It is helpful because if it needs an intelligent charge this can be done in a timely manner rather than the battery sitting semi-charged which is damaging. Slick service, fast delivery, easy website, straight through quicker than ebay and very competitive prices. Excellent service and product seems good. Time will tell but well satisfied so far. Got this to replace a Westco I got 3 and a half years ago (expected longer considering I use an optimate). The battery came quickly and fits well but note that the cutout on top of the battery is smaller than the standard fitment and the Westco. This matters on my bike because the holding bracket fits into it so I had to modify the bracket. Filling the battery is also a bit fiddly and in the end I had to resort to punching holes in the top of the acid container to get it to fill. Great battery! Fitted to my TOM 850 May. Selected as an AUXILIARY battery (front) for my Mercedes E320. 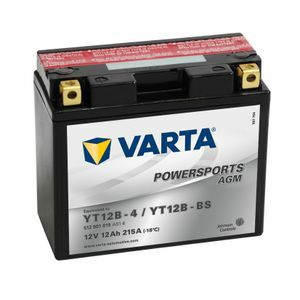 MB sell a similar OEM battery for £97 !!! This model is not only half the price, and compatible in size and performance to the OEM "FIAMM" battery, but it also had a higher CCR ! Another great choice and service from Tayna ! Good price. Prompt delivery. Very happy with transaction.